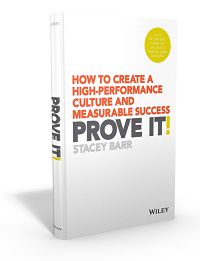 We have lots of reasons not to measure performance: not enough time, not enough good data, not enough engagement from colleagues, not enough support from leaders, not enough clarity in our goals, not the right timing, and so on. These are all constraints. But they shouldn’t be showstoppers. I have a calf injury that means I can’t run. I gave it a few days rest, tried to run and it tore again. Gave it even more rest, plus some physiotherapy, ran again and it tore AGAIN! I could throw my hands up in the air and give up until it heals fully. And it would take ages to get my running fitness back. Instead, I am executing a plan that will return me to running feeling stronger and faster than I’ve ever felt. How’s this possible? It’s possible by accepting the constraint that the injury is, and working out what I can do to lift the constraint AND still improve within it. Know when not to push. First and foremost, I need to understand my calf injury. It’s a tear in the soleus, so that means no running, no action that involves my calf having to absorb my body weight on its own. For performance measurement, this means understand how people really feel about it. Be gentle with the colleagues who aren’t engaged with measurement. Be gentle with the leaders who won’t support it. Be gentle with yourself, when time is against you. Don’t push with your insistence, your frustration, your cajoling, your expectations. My physiotherapist gave me some exercises to do, but he warned me to stop immediately if my calf gave a ‘signal’. He meant listen to my calf and as soon as I feel something that’s not right, stop. For performance measurement, this means listening to what people are saying about why they don’t engage or support your ideas for better KPIs. Behind their words, what are they REALLY saying? That they’re scared? Confused? Bored? And don’t forget to listen to your own internal chatter too, about your expectations and beliefs and attitudes toward measurment. Is that chatter helping you? Find out what you CAN do within the constraints. With advice from my physiotherapist and my running coach, I created an interim training program around activities that don’t push my calf, but still strengthen it and help it heal. These include ashtanga yoga, spinning and cycling, specific strength exercises, some CrossFit, and aqua running. For performance measurement, don’t wait until all your ducks are lined up in a row before you do anything. Work out what you can do even without the support or time or resources you’d really love to have. Maybe you can focus on measuring just one important goal with your team. Or perhaps broadening or deepening your knowledge through reading or a training course. Talk with colleagues until you find a few kindred KPI spirits. Create a long term plan, and set up some short term steps you can do on your own. The aqua running I’ve been doing has amazed me. I get a great cardio workout because the treadmill is right in front of a water current machine that can pump pretty hard! But running in the water also acts like a magnifying glass on my technique. I can feel imbalances, I can feel where I’m not relaxing and where I’m pushing. As I’m practicing my technique, I get the feedback from my heartrate monitor when it’s working: my heartrate comes down. 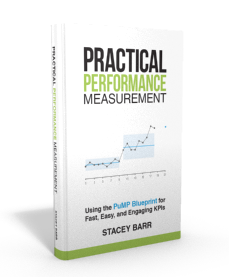 For performance measurement, this means practicing things like how to de-weasel your strategy, how to design great measures, how to engage people in performance measurement, how to design powerful performance graphs and dashboards, how to interpret measures and choose improvement strategies that deal with the root causes of poor performance. Let me repeat the important word here: practicing. Practicing makes you better, and the results come easier. When my calf feels tired or a bit tight, I back off. I give it a day off or stop the strengthening and back off the intensity. I ice it, massage it, use topical magnesium oil (and even talk to it nicely). And I’m also learning to integrate these recovery strategies into my normal daily routine too. For performance measurement, we need recovery too. This means time to consolidate each step in the measurement process before you charge into the next one; time to reflect and lock in what you learn; time to check in with how everyone is going with it all; time to celebrate great steps forward. Just as I am super confident I will return to running stronger than I have ever been, I am sure you will be stronger in managing and measuring performance if you adopt a similar philosophy. What are the constraints that currently hold you back from having the KPIs or performance measures that would open the door to performance excellence? Choose 3 small things you can start this week (one you can start today) that will help your organisation master performance measurement and achieve performance excellence easier, and sooner. This post came at the right time for me, Stacey! At times it gets frustrating because things aren’t perfect and I know that I’m collecting data that isn’t ‘good’. This has reminded me that at least I’m collecting something, and perhaps with that something I can one day get something better, use it to engage people, or ask for something else. Thank you, as always, for your inspiration. Hi – great article. I really enjoyed it. The links within the article are not working. Thanks! Thanks so much for your comment! 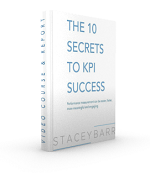 I just wanted to let you know that I tested the links here on the blog and they are working okay so you can access them here http://www.staceybarr.com/measure-up/improve-your-kpis-in-spite-of-what-holds-you-back/. But if you were trying to click through directly from the ezine, it is an issue that comes up from time to time and relates to a problem with Internet Explorer that when it detects a redirect and there’s anything on the final landing page whose origin the browser can’t quickly validate, it throws an error that keeps the page from displaying at all. To overcome the problem you could try changing your web browser. Clarisa – nice to hear from you! So glad you can appreciate where you are right now AND where you can be. Knowing point A and point B is the start of mapping the journey!